The Briers Julie Dodsworth Flower Girl Gardening Apron B6992 is a practical yet stylish solution for keeping soil and dirt away from your clothing while gardening. It also includes front pockets, which are ideal for storing and carrying around gardening tools with you. 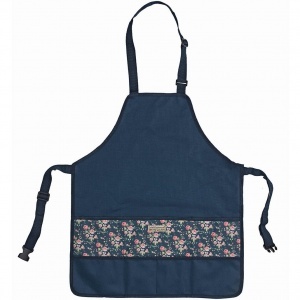 The Briers Gardening Apron is provided in one standard size to fit most individuals. While this makes purchasing more convenient, as there is no need to obtain accurate measurements, the apron also comes with the added benefit of being adjustable. It features a neck strap and a waist strap, both of which can be adjusted for a more comfortable fit. In addition to preventing dirt from touching clothes while gardening, the Flower Girl Apron also enables tools and equipment to be stored and carried around with ease. It features pockets on the front of the apron, an ideal location for storing trowels, forks, dibbers, and other small tools within easy reach. To add a touch of personality to the apron, the front panel has been adorned with an attractive floral Julie Dodsworth Flower Girl pattern. This adds a touch of dash of colour to your outfit while gardening, making the experience of sowing, seeding, potting, or weeding more enjoyable.